It is a well-known fact that there is little freedom in terms of winemaking in most of the historic wine regions of Europe. Appellation laws put out by the government set strict guidelines as to what grape varieties can be planted, what training systems can be used in the vineyards, methods of winemaking, ageing requirements, and final levels of alcohol. While in many cases, this is a result of centuries of study as to what methods will produce the best wines in a particular area, it can seem rather limiting for innovative or rebellious winemakers who want to experiment with something different. The “new world,” and particularly California, has been a haven for experimental winemakers who want to try something different. Indeed, “flying winemakers” from Europe and around the world often come to California to work a harvest, and some even end up staying and opening up their own wineries or participating in joint ventures with the locals. Yet in spite of its image as an “anything goes” wine area, the most famous region in California is arguably as restricted as Europe. But it’s not the government that inflicting the limitations here; it’s the market. Napa Valley is the most expensive agricultural region in the Americas. They say that in order to make a million dollars in Napa, you have to start with at least a billion. And if you’re going to have any return on investment, you have to produce what brings in the profits. The Napa Valley was once home to a wide range of grape varieties: Riesling, Chenin Blanc, Petite Sirah, Zinfandel, Gamay and more. Then, in 1976, the Judgment of Paris tasting happened. This was arguably the most important event in California, or indeed United States wine history. This tasting, organized by Steven Spurrier, the renowned British wine critic, took place in France and pitted the famous French wines of Bordeaux and Burgundy against Cabernet based blends and Chardonnays from the Napa Valley. Much to the amazement of the world press, Napa Valley came out on top, with Chateau Montelena’s Chardonnay and Stags Leap Wine Cellars’ Cabernet Sauvignon taking the top spots. After this tasting, Napa Valley came to be recognized as a first-rate wine region, and people have been flocking there ever since to get a taste of its nectar. Yet the Judgment of Paris had its unintended consequences as well. With the top wines being Chardonnay and Cabernet, these varieties suddenly became the darlings, and the wines that could command high prices. Soon, other grape vines were being grubbed up and replanted with these varieties. 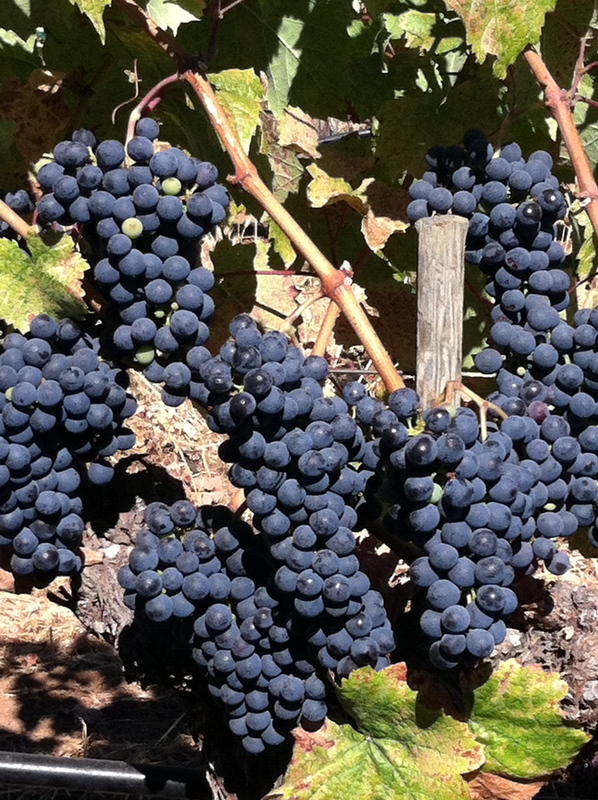 Cabernet, in particular, became the cash cow for the region. These days it is nearly impossible to find any winery in the valley that doesn’t specialize in Cabernet Sauvignon, and indeed, for any new venturers to the region, making an expensive Cabernet is almost a requirement because that’s what brings in the return on investment. It is rare to find a Napa Valley Cabernet priced at below $50/bottle, and wines at $100, $200 or more are becoming increasingly common. It seems that the only people who are able to make alternative varieties in any great number are those who have been there since the early days. I recently tasted a stunning Riesling from high up on Spring Mountain at Smith-Madrone winery. The wine was easily on par with grand cru examples from Alsace, and yet these days no one thinks of Riesling and Napa Valley in the same sentence. 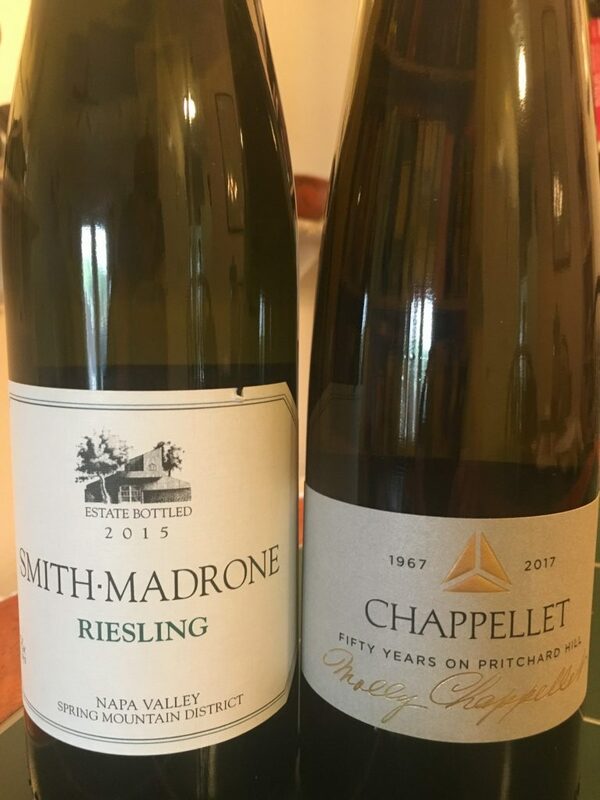 While it’s true that most regions in Napa are far too warm to produce fine Riesling, Smith-Madrone proved that there are pockets of Napa that can make world class Riesling. Yet the Smith brothers, the proprietors of this winery, are old-timers who purchased the land in the 1960s before it became the king’s ransom that it is today. Another pleasant surprise was the Chenin Blanc from Chappellet. The Chappellet family established their winery up on Pritchard Hill in 1967, and they are one of the few who still produce this once prolific variety. The wine showed such complexity and racy acidity, it was an easy favorite, and according to our host, it is also matriarch Molly Chappellet’s favorite. However, as I mentioned, these two wineries have been around for a number of years and can afford to trifle with varieties that don’t command high prices. But the truth of the matter is that you are unlikely to find much more beyond an extravagant Cabernet from any new wineries looking to establish themselves—there simply is not enough return on investment. Sadly, gems like the Smith-Madrone Riesling and the Chappellet Chenin Blanc are few and far between in Napa, and when the next generation takes over from the old-timers, we may see even less of these treasures. Still, there may be hope for change. Over time, tastes can evolve or be swayed. Perhaps we will see a new Judgment of Paris for the 21st century that involves alternative varieties, or maybe people will begin to realize that Napa does not have to be synonymous with Cabernet. When, and if the fashion for new grape varieties shifts, I’ll be waiting with my glass raised. This entry was posted in Grape Varieties, Wine Regions on April 3, 2019 by Kareasa.